Learn how to make some delicate Summer bracelets using the NEW Swarovski Innovation Scarab Beads for Spring/Summer 2017. 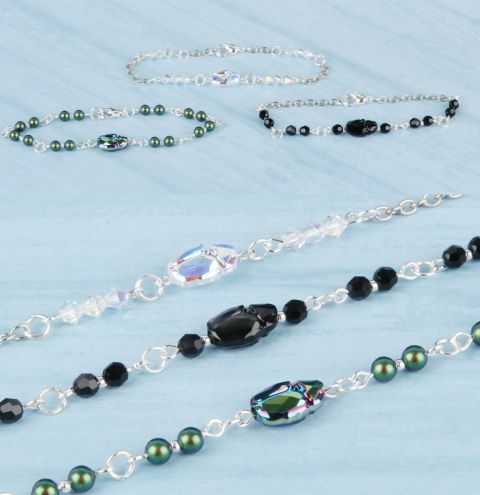 The technique for each bracelet is the same, you simply create small bars of bead either with or without crimp beads inbetween. Then connect the bars together or space them out using small pieces of chain. Turn your Scarab into a connector by threading it onto an eyepin and creating a loop at the end, close to the bead. Attach a small jumpring to both loops. Create your beaded bars by threading three crystal bicones (seperate with crimp beads if you wish) onto a headpin and create a loop at the end as before. Attach one to either end of the Scarab bead using the jumpring. Add a jumpring to each end of the beaded bars and continue to add more beads like before, or small pieces of chain of equal size. When you reach your desired length, finish with a lobster clasp and larger jumpring at the ends.